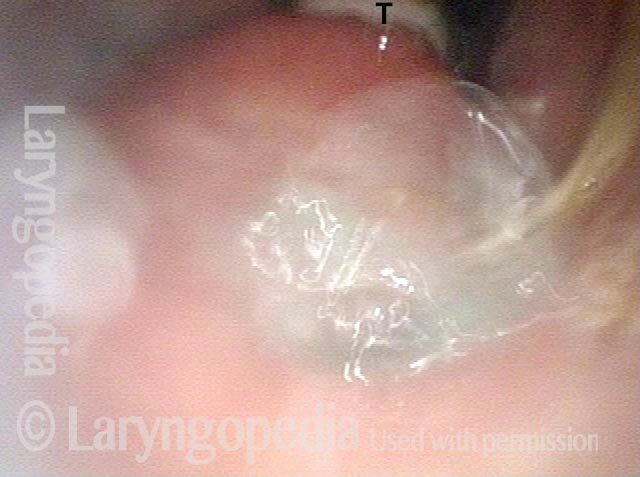 The leaking of saliva outside of the pharynx (“throat” part of the swallowing passage) through a defect in the pharyngeal mucosa lining. This may occur transiently in up to 20% of persons who have undergone total laryngectomy, with the sixth postoperative day the peak time of incidence. Prior radiation therapy seems to increase the risk of fistulization. Traditionally, the treatment was to make a midline incision directly, insert a penrose drain, and then use pressure dressings. Modern treatment uses suction drains to control salivary leakage and allow the rest of the skin flap to adhere to the neck1. Then, the drain is removed, shortened, and replaced a series of times to allow the tract to close from top to bottom. 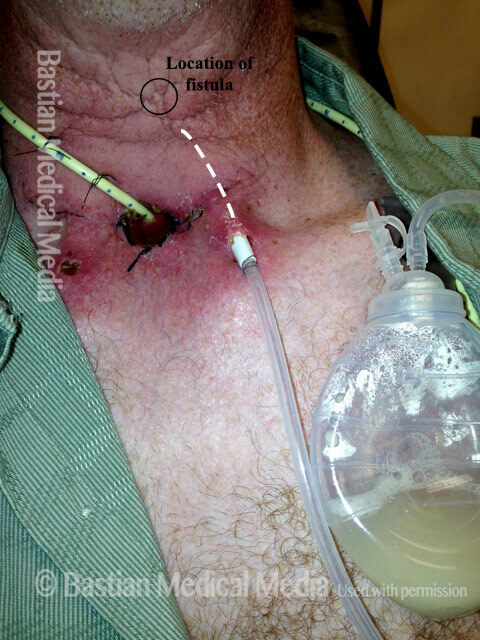 Closer view of fistula opening and esophageal entrance, with salivary pooling. Patient receiving suction drain treatment. The suction tubing evacuates saliva drop by drop as it forms, eliminating the need for wound dressings and long term antibiotics. This treatment also prevents infection and causes less discomfort for the patient than traditional treatment.